This guide is the ultimate go-to guide to building your colony, for all stages of the game. There are different ways to build your base. Put everything in one large building. Build everything in separated buildings, just like a small town. In mountainous maps, dig inside the mountains. Different structures suit the different needs of your colony. The maps generate with old structures around, sometimes just walls and others are squares/rectangles just missing some sections. If conveniently located, these can work perfectly as starting points, reducing considerably the initial workload of characters with low level skills and reducing the beginning stresses when you still have nothing. Currently, the first room we need to build is storage, due to items deteriorating if left outdoors or exposed. Place a stockpile zone covering most of the room except for the tiles adjacent to the doors as sometimes pawns may accidentally drop an item in the doorway, leaving it open and insecure. You can have multiple smaller stockpile zones set to allow specific different items to better organize them. Your store room should be built close to the workshop to minimize travel times for raw materials. Give special consideration toward explosive items such as chemfuel or mortar shells as they may set blow up and set ablaze your entire stock. Place them separate in a stone made compartment and far from the exterior of the base to prevents doomsday rocket launchers from hitting the items as they can pierce through walls. Place a firefoam popper here to protect against fires igniting your munitions. In mid-game, you can add orbital trade beacons to sell your stuff to trade ships. The barracks is a room where multiple pawns share a single sleeping space. This is easy to host your colonists early in the game, but it proves inconvenient as walking pawns will disturb the sleep of other occupants. Furniture such as sleeping bags/beds improve their comfort. The better the sleeping spot, the faster they wake up and become more productive during their schedules. 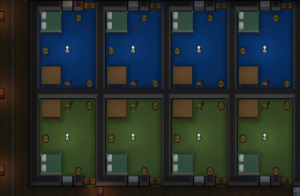 You should upgrade your colony to provide private bedrooms once the basics are covered, and you can later on turn the barracks into either a Hospital or a Prison barracks. You can upgrade a barracks with positive mood modifiers by placing sculptures, nice flooring, temperature control utilities and high-quality furniture like dressers and end tables which increase the comfort of many beds at once. Colonists like to eat as soon as they wake up. You many place a table and chairs inside at the beginning, but try to reinstall them elsewhere when you can. Colonist entering to eat will increase disturb the sleep of others. Build the dining room close to the barracks once the sleeping quarters are done. Mid-game bedrooms from Alpha 17. Each is carpeted, has beds, tables with chairs, flower pots for decoration and a vent connected to the corridors. Bedrooms are private sleeping spaces which remove "disturbed sleep" mood penalty caused by other pawns. Couples will want to sleep together and won't disturb the sleep of their partners. However, they will need a double bed. You can improve comfort and rest effectiveness by building beds of Normal quality or above. Build the "Dining room" close. Build one set of table and chairs outdoors near many bedrooms. Place tables and chairs inside. However, make sure to turn off the "Gathering Spot" option of tables, as others seeking joy may enter someone else's bedroom and disturb their sleep. The Freezer, Kitchen, Dining Room and Recreational Room are often adjacent to one another. From these four, only the kitchen should be somehow isolated from the rest to reduce dirt caused by walking in, but still attached to the freezer only since colonists shouldn't necessarily have to pass through the kitchen to get a meal. Parties and wedding ceremonies take place at Gathering Spots where chairs are detected, and since pawns don't eat during these times, their proximity to the freezer is convenient to go get a meal and come back to the tables. The Freezer is a stockpile room to preserve raw food, plant matter and fresh animal corpses. In non-freezing biomes, this is accomplished with the addition of coolers set to low temperatures. Freezers are vital for food preservation in hot biomes. Cold biomes, on the other hand may be able to perform well without need of air conditioning. Even though food freezes at 0 °C (32 °F) you should have your freezer at least set at -5 °C (23 °F) since it will lose temperature whenever a colonist comes in. Coolers placement is of crucial importance as these devices have a very low 100HP, which means the weakest point in a wall from where raiders would break in easily and most likely ignite your food supply. Because of this, one of the best ways to keep protect your coolers is to place them facing a mountain if there is one nearby to build a wall around their hot side. In both cases, make sure to remove any roofs. If your base is in a cold biome, yet another option is to direct their hot sides into your living space to help heat it. It is common to make the freezer with double walls to increase insulation. The freezer is vulnerable to solar flares. In freezing biomes, food still needs to be kept from spoilage to exposure. In which case, wall it off and add vents to the exterior to let in the cold air. Unlike any other room, the freezer will need to be expanded as population increases, meaning that you should at least leave one of it's sides unoccupied by other structures so that in the future you can just increase the capacity without need of deconstructing other rooms, nor place it by a mountain side. Because you will be storing your harvests here, it is wise to somehow position this room in proximity to your fields and to shorten hauling jobs, with the doors also pointing towards your growing zones. It is common to make airlocks in the entrance of the freezer to reduce that temperature exchange. Since colonists and haulers will enter this room so much, build autodoors once researched to both speed entry/exit and minimize temperature change. Butcher spots, butcher tables and crafting spots can be placed inside the freezer to butcher corpses, make kibble and make smokeleaf joints since the work to make those is so small and the ingredients are in the freezer your colonists might as well do it there. However, for mass production, it's better to have it close but outside the freezer due to the work speed penalty. Consider making an exclusive stockpile with high priority at the front of your freezer which only allows meals, so that cooks will always store them closer to ease retrieval. The same planning can be applied for two more stockpiles at the front of your freezer for meat and veggies, to speed up ingredient pick-ups (colonists assigned to hauling and trained animals will move ingredients from the back of the freezer to the front). Nutrient paste dispensers act as walls. They are usually placed with their hoppers in the freezer and activation spot in the dining room. The butcher table should be placed in a different room as it creates a lot of filth. You should build your kitchen right next to your Freezer. Shelves or small stockpiles can really improve cooking efficiency when placed right next to your stoves. Set one to accept berries and vegetables only, and the other to accept meals only the as these do not spoil in a matter of days, unlike meat which should always be in the freezer. Hauling colonists will do the transport work for your cooks instead, assuming you can actually spear the manpower and the cook is also useful for other tasks. It is usually a good idea to add a little art since colonists tend to stay there for a long time. It should be temperature controlled for better working speed. Since the kitchen is placed near the freezer, some crafting stations which include plants ingredients may be also placed in here. The brewery and drug lab are good choices. Also, if you making chemfuel with food you may place the biofuel refinery here. Dining rooms, at their simplest, are simply rooms where you put tables and chairs for colonists to dine in. Still, tables are marked as Gather Spots by default. Colonists will hang out here to relax and also hold their parties and weddings here. Expect your dining room to be pretty crowded during meal times, especially after a party or marriage ceremony, so have enough chairs for at least half your colony. Colonists as well as visitors will search in a 20 tile radius for a table to eat at. 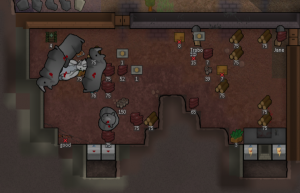 For this reason, a dining room should be built as close as possible to the freezer/food storage so that your colonists will actually use the dining room, instead of eating on the floor of the storage, giving them a -3 mood debuff. This is especially true for larger freezers, in which colonists retrieving food from the far end may simply give up searching for a table and eat on the floor. Since colonists spend a lot of time here, increase their mood by decorating your dining room with sculptures, plant pots or quality furniture. You should have a wide variety of recreation sources so your colonists don't get bored repeatedly throwing horseshoes at a pin, or wandering around aimlessly. 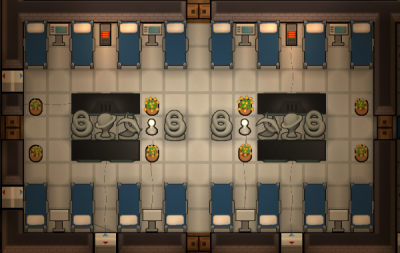 Putting all of them in a room also provides a mood bonus after a colonist uses the facilities inside, depending on the impressiveness of the room. In the early game, all you'll need is a horseshoes pin somewhere in the colony, and colonists will proceed to use it when they are bored. Once you reach midgame, you can afford more joy facilities such as chess tables or billiards tables, or Tube televisions, which provide different kinds of joy for additional variety. In addition, you can also obtain additional joy sources from exotic goods traders, such as telescopes or megascreen televisions, which are more joyful than the craftable tube and flat screen televisions. Similarly to the dining room, decorating it can improve the mood bonus from using the room. Small courtyard that serves both as a dining room and recreation room. Most colonists like getting outside once in awhile. In superstructure bases, you may consider building an unroofed courtyard where colonists can get some fresh air. You can use it as a common area, putting joy items and dining tables for colonists to use, making the courtyard behave exactly the same as an unroofed dining/recreation room. Alternatively, it may also be used as a place to put your mortars as putting them in the middle helps reduce their minimum range blind spot. Also consider keeping transport pods here, however place them in a separate unroofed area as they are not beautiful to look at. You may want to have a room dedicated to research, with hi-tech research benches, multi-analyzers to increase research speed and unlock new research. Room cleanliness affect research speed, so place sterile tiles to keep the room clean. For even better cleanliness, restrict the lab to your researchers and janitors only, reducing traffic and hence the amount of dirt in the room. Also consider placing some art here and building a comfortable chair, as your researcher will be spending a lot of time here. Workshops are places where you put all your crafting stations and benches. You should put them near your warehouse so your colonists can spend less time hauling the needed resources to the workshop for crafting, while keeping them separate due to the beauty penalty of raw materials. Also remember to put chairs of any sort at the interaction spot so your colonists won't have to keep standing while crafting. The tool cabinet is handy for increasing productivity of your craftsmen, but you will need to allocate the positions of these carefully so as not to block walking paths for colonists or future plans. It is an excellent idea to put decorations such as sculptures inside the workshop, as a beautiful environment gives up to +15 mood, improving colonists' productivity and even allowing for the occasional mental inspiration. You can choose to have a dedicated area to store your weapons and armor. If so, put it far away from your prison so that prisoners do not have ready access to dangerous weapons. Place it near your entrance so that colonists can equip themselves on the way to defend your base. Hospital with sterile tiles, hospital beds with vital monitors, decorations and megascreen TVs facing the beds. Dedicated hospitals are more of a mid-game thing when you have enough resources to build the specialized equipment used in them. Hospital beds provide a boost to treatment quality, immunity gain speed, and healing speed, meaning colonists will recover faster from illnesses and injuries, making them the choice for hospitals. The vitals monitor brings even better boosts to treatment and immunity gain, so when available it's recommended that you put them down near your hospital beds. Hospitals should be built somewhere where colonists can quickly bring their downed comrades to treat them. Keep doors open, or use autodoors so they don't obstruct colonists' access. If you need to, you can build more elsewhere in the base. Store your medicine in or near your hospital using shelves so your doctors can quickly grab them to patch up colonists before they bleed to death. Sometimes just that little distance can make the difference between life and death. Hospitals should have sterile tiles as flooring as they provide a slight cleanliness buff that can increase surgery success chance and reduce wound infection chance. Keep in mind that wounded colonists will bleed out considerably, so you may want to assign another colonist to specifically clean the hospital to improve their treatment chances. Decorating hospitals to make them beautiful can give colonists inside a great mood boost (max +15, plus impressive room stats). This is good, especially considering that some colonists will stay in the hospital for some time, such as the severely injured, incapacitated or sick. To provide joy, you may also install televisions into your hospitals. Patients lying in hospital beds within the viewing area will watch TV to entertain themselves when they are bored, and you won't need colonists coming to cheer them up as their only recreation source. If you have even more resources you can build a separate room for each colonist. While they don't mind sleeping with others in a hospital, they do get disturbed by them walking around, and dirt can more easily affect cleanliness as well. You can build a separate room to accommodate colonists who will undergo surgery, to make sure that colonists undergo medical operations in the cleanest of places. Your operating theater should be forbidden at all cases except when someone is about to have surgery. This prevents colonists from tracking dirt or blood into it, staining it. Also consider building animal sleeping spots with their own animal area near your medicine stockpile that you can restrict wounded animals to. That way, they can be treated as fast as possible. Mid-late game prison blocks from A17, partially filled. Each cell has a table with a chair, a bed, decorations and a chess table with a chair (for decoration). Generosity like this is well-appreciated and rewarded with prisoners joining your colony. Note that the doors open towards the rest of the base (downwards). In the early game you can simply convert any existing ruins into a makeshift prison barracks or build a simple prison hut which holds all the prisoners you capture. 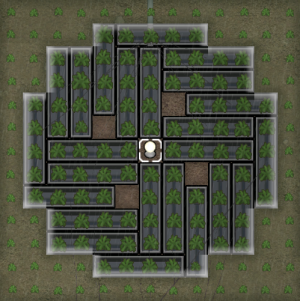 Try not to build it too far away from your main structures, otherwise it becomes harder to catch escaping prisoners. 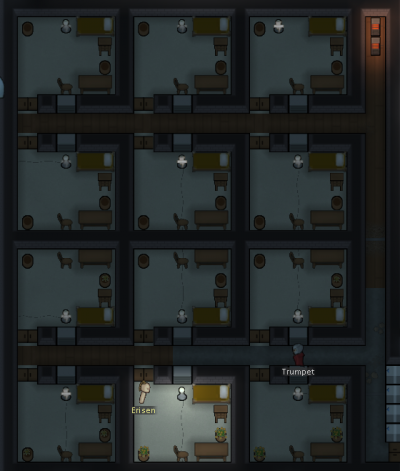 Another option is to mark one of your colonist's bedrooms as a temporary prison while you build another bedroom or a proper prison. You should include tables and chairs for prisoners to use. This will improve their mood, which by extension lowers their chances of mental breaks and improves their recruitment speed. Like colonists, prisoners will also suffer from the mood penalties associated with being kept together in a prison barracks. In addition, prison breaks are more serious should they happen, for every prisoner locked up in the same room will simultaneously break out, while prisoners in different cells may choose not to join. Thus, you should keep them separated. Each cell should have a table with a chair, a bed, and a light source. This is the bare minimum you need for a prisoner to be decently kept. Decorating the cell and making them bigger also increase mood bonuses for easier recruitment. They can't use any joy items put in the cell, nor do they have a joy need, so don't bother with recreational items other than for room impressiveness. Prisons should have doors facing towards your base, so escaping prisoners will go towards your base instead of away, giving your wardens more time to deal with a break. A larger cell with more beds. It should be only be used when your prison cells are overflowing. Put your less important prisoners inside them while assigning your more valuable prisoners into the cells. These are more of an early to early-midgame thing that you can use before you get dedicated structures erected, such as hospitals or bigger prisons. Yet, these can still prove useful sometimes, like when your freezers or warehouses overflow, or you need somewhere to house an influx of injured or sick colonists. This is rather simple; just make an empty room, along with suitable temperature control. You can add beds if you intend on someone living in it (be it colonists or prisoners), which you can uninstall and tuck away in a corner when unused. Shelters: Building small rooms with an emergency food and wood supply can save your colonists from enraged animals. Thick enough walls (at least 4 layers) can stop raiders from killing your colonists hiding inside. Nutrient paste dispensers: When food is running low or you forecast that it will, a paste dispenser can significantly slow down food consumption by efficiently converting raw foods into nutrient paste. You will also need various buildings to produce or manufacture the stuff that your colonists need. Sun lamp illuminating crops grown in hydroponics basins. With this configuration you can fit 24 basins under 1 sun lamp for a total of 96 plants grown. Crop fields are rather simple. Just set up a growing zone, designate the desired plant type and growers will automatically go and grow the plants. You need to check carefully the soil fertility before marking out your areas. Stony soil looks quite similar to dirt at first glance, but has a greatly reduced fertility, reducing the growing speed of plants. Rich soil on the other hand, is visibly darker and has improved fertility, making it suitable for long growing time plants such as devilstrand. You will need to keep most animals from eating your crops. You can zone out the area from your tamed animals, but you will need to build walls to keep out wild animals. If you're not building a greenhouse, then watch out for your builders automatically roofing this "room". Enclosed areas that grow crops with the aid of temperature control, sun lamps and possibly hydroponics basins. They allow you to continue growing crops regardless of soil or weather conditions. Note that greenhouses are subject to power draining events like solar flares, knocking out lamps, heaters and hydroponics. In early-midgame you just need to select mineral outcrops and designate them, and miners will proceed to dig out the minerals. Later on, you can choose to continue mining through several means. If you have more mountains or rocks which you can mine, you can strip mine them by mining out long tunnels with 2 tiles between each other. This allows you to cover everything in the mines. Covering up your mine to prevent infestations is a good idea, using cheap materials such as wood it is possible to completely seal up the mines at a low cost. Alternatively, set up defenses at the mine entrance and just farm the insects. After research you will unlock the deep drill and the ground-penetrating scanner for use. It is not recommended to start deep drilling without an active scanner as you cannot see the locations of mineral locations. Some deposits will be directly underneath your base. You can deconstruct or relocate buildings to give access to your drills. Be careful when you mine in colonists' bedrooms as they can easily disturb sleep. Animals are an extremely useful asset to the colony. They provide a variety of products, from raw food materials (meat, eggs or milk), to wool, which is an excellent insulator against both heat and cold. Moreover, they can be used in combat or as pack animals in a caravan. In fact, some larger and more intelligent animals can be trained as haulers, freeing up colonists for other tasks. Animals are happy to sleep anywhere as long as it's not too hot or cold. Otherwise, a temperature-controlled barn with animal sleeping spots is necessary to keep the animals comfy. Building animal sleeping boxes or animal beds can help animals rest faster, though this doesn't really do much and is not cost efficient. Boomalopes are unique in the fact that they can produce chemfuel. This can be used to power generators, used as transport pod fuel or made into mortar shells. Due to their explosive nature, they won't be attacked by predators, so you can let them roam freely without much danger. Keeping them confined is dangerous as the death of one boomalope can injure others, and if you don't intervene the other boomalopes will die, exploding and causing a chain reaction. Solar generators provide power only during the day except during eclipses. It provides 1700W, quite a decent figure, but still shouldn't be fully relied on. Wind turbines provide unstable power day and night. It can provide up to 3000W, but it usually gives less than that. It requires plenty of open space for maximum efficiency, and any obstacles can easily reduce efficiency. To prevent trees from growing and obstructing the turbines, put down floors, grow crops underneath the turbines or fill in the gaps with solar generators. You can build the wood-fired generator which runs on wood, or the chemfuel powered generator which runs on chemfuel, constantly providing 1000W of power. It is a good idea to have some of these as a backup power source, or even as your main source in biomes that are loaded with forests that will replenish themselves, such as in the tropics. Chemfuel is significantly more efficient than wood, so once you research the refinery it's a better idea to refine wood into chemfuel before usage as fuel. Boomalopes generate enough chemfuel to run 2 generators. 2 boomalopes give enough fuel to continuously power 5 generators for a total of 5000W. This is not taking into account any energy costs from growing food for use by the boomalopes. Infinite chemreactors generate enough chemfuel to run a generator, which in turn generates more than enough power to run the chemreactor. 8 infinite chemreactors can generate enough fuel to power 15 generators, for a total surplus power of 12600W. Geothermal generators constantly gives 3600W of power after being built on a steam geyser without requiring fuel. It is an important source of power from mid-game onward, as it is constant and high-powered. Research is required to unlock it. The generator itself is quite costly so it's best left to midgame. However, once researched and built you can have a constant power supply. With 5 generators on the map you can sustain a basic mid-sized colony. It is possible to rush the research for geothermal power, though you should be careful not to neglect other more important research projects. Make sure your geothermal generators and their connecting conduits are well-protected as they often have to be placed far from base. Walling the generators helps protect them against raiders, but walling the conduits isn't recommended due to the cost and its hindrance on colonist field work. Be aware of the heat that the geysers release. If you closely wall and roof in a geothermal generator, the temperature inside will be quite high, high enough in fact to catch combustible building materials on fire. Consider removing the roofs on such buildings. However, if the vent is close to your base in a cold biome, consider attaching its building to your own base to help heat it. Batteries store electricity during times of excess and release it during times when demand exceeds supply. You will need batteries to store power if you're using unstable power supplies such as wind or solar power. Batteries must be kept under a roof to prevent short circuits. They should also be protected from external threats as attacking batteries at night can turn off anything attached to them, including turrets. Backup batteries: Always have spare power stores, such as separate battery systems with switches. Only connect extra when your main grid has run out or the reserves need charging. Backup generators: Have some fueled generators that you bring online only if there's not enough power in the colony. This can allow your backup batteries to discharge slower or even recharge. If they are turned off they will not consume fuel. A vanometric power cell constantly provides 1000W of power regardless of any condition and can be placed nearly anywhere. Obtaining it can be quite hard due to its rarity, even in the mid-late game, yet a constant, uninterrupted source of power is always valuable to any colony. It can be used as a good starting power source when you are branching off to start a new colony. If not currently being used, batteries will slowly self discharge. Consider placing a vanometric power cell with your reserve batteries to keep them topped off, as well as to recharge them if you forget to. It's not a good idea to have just 1 conduit spanning the entirety of your base. While it saves materials, short circuits or other events can cripple your power supply to parts of your base. Instead, build a network with redundant pathways so that the grid will continue to function even if there is a break somewhere in the network. Consider using doors to cover up the beauty penalty for exposed conduit indoors. Since geothermal generators must be built on top of existing geysers, they are often located far from your base. It is best to connect geothermal generators to other geothermal generators so that events such as wildfires and raider attacks won't easily disconnect them from your power network, causing severe power shortages. Unless you're playing on Peaceful difficulty, you will eventually encounter major threats, so you will need to prepare defenses for that. The greatest advantage on your side is cover. While enemies are hiding behind rock chunks, you have sandbags and walls on your side, giving you a significant upper hand. You can even clear the rock chunks to force enemies behind trees which are less optimal a cover choice, widening the advantage. You can also choose to build turrets if you have unlocked them. They are essential if you don't have enough colonists to defend against raids, most typically the start of the Rich Explorer scenario. Room should have its temperature regulated by some method or another, so as to keep a comfortable temperature for colonists to live in, and protect them from extreme temperature conditions such as heat waves, cold snaps or simply the ambient temperature outdoors. Large rooms such as your dining room or rec room should have their own heaters and coolers. If they are interconnected you may want to open doors for faster colonist access and temperature exchange. If you choose to do so, remember to close doors if a fire breaks out in the room. Colonists will complain if sleeping in the extreme heat or cold. Bedrooms and other smaller rooms should be thermally connected to a larger central space via vents. Your heaters and coolers should be all placed outside the bedrooms. This reduces the number of heaters and coolers you need to build while keeping your bedrooms at a comfy temperature at the same time. Keep in mind that you will also need to be prepared in case of a freak temperature event such as heat waves or cold snaps. Without enough temperature devices rooms can get uncomfortably cold or hot, and in severe cases begin to cause hypothermia or heatstroke. As coolers need to be built as part of a wall, the process of building a cooler involves tearing down the original wall, then putting the cooler in place. This short interval allows temperature to go freely through the gap, which isn't something you want. To fix this, you can plug the gap by building a cheap wooden wall in front of or behind the cooler blueprint, then starting work on the cooler. The wooden wall will prevent temperatures from equalizing easily. Remember to deconstruct the wall after the cooler is done. Coolers are very fragile and must be placed in a wall, so a single explosion or dedicated effort from melee attackers can easily break them down. Protecting the coolers helps fortify your base against enemy raids by eliminating the weak points in your walls. This is done by walling the coolers off while giving it unroofed space in front of the hot end to vent away heat. If your colony is in a cold but not quite freezing biome, consider venting the heat from the coolers for your freezer into your living spaces instead. Place several coolers in line with the hot end facing an unroofed area where the heat vents out into the open. That unroofed area can be placed within an existing structure, such as inside the freezer. For maximum spatial efficiency, the strips of unroofed area should be 1 tile wide, surrounded by coolers. This best used for freezers to keep cool as most cases don't call for many coolers. If your regular heaters or coolers aren't doing the trick, there's a temporary power outage or you're a tribe without the ability to harness electricity yet, you can use campfires or passive coolers to heat or cool down your base respectively. Both have the same effect as their powered variants, except they are rather limited in their available temperature range: campfires can't heat above 30°C while passive coolers can't cool below 15°C. Also, their temperature effect is full and cannot be throttled. Depending on what gear your colonists are wearing, it's possible for them to be in a room being heated with campfires and complain about it being too hot. These are best used to keep colonists comfortable during heat waves or cold snaps. If you always encounter uncomfortable temperatures during summer or winter, then it's time to upgrade your heaters or cooler system. Until you have enough manpower to spare for cleaning jobs, use the terrain directly instead of building any floors. Dirt trailed on constructed floors makes for a much worse beauty and cleanliness penalty than using dirt floors, so this can actually make your rooms look better and be 'cleaner'. For places like hospitals however, it's better to use sterile tiles and manually clean them instead. To reduce the amount of dirt inside your colony buildings, put any kind of flooring covering places where colonists and animals frequently walk. This reduces the amount of dirt formed as well as causes dirt to be left outside where it does not look as bad. This should obviously be done only if you have enough janitors, otherwise it's better to just not build any floors (see above). Bridges allow for fast movement and some building on shallow sections of rivers and marshy terrain types. They're great for allowing colonies to span rivers, as well as making building in swampy biomes a bit easier. Note that some objects cannot be built or placed on bridges. Moisture pumps clear out moisture from the ground around them, making solid land that is suitable for construction and in most cases, agriculture. They are excellent in swamp biomes for clearing out shallow water, marshy soil and mud in order to build structures. Their effect is permanent, so they can safely be deconstructed once the land you want to use is dry. This page was last edited on 28 March 2019, at 22:07.